The last time I stood on top of a roof was in 1979. With the multi-colored tiles of St. Stephen’s Cathedral, one of the most recognizable symbols of Vienna, Austria, behind us, my mother and I tried not to look down through the open grillwork under our feet and clung to the railing as my dad enjoyed the panoramic view of the city. 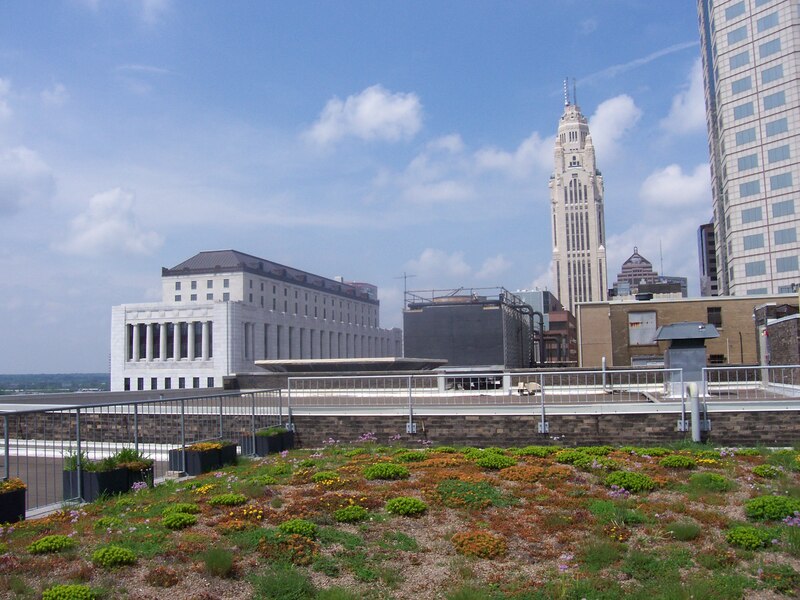 I had a much different experience last Friday, when I walked around the Green Roof of the Lazarus Building and saw a unique view of Downtown Columbus. The building now known as 50 West Town Street opened in 1909 as the F. & R. Lazarus Company. When Lazarus closed in 2004, the 120,000-square-foot building was transferred first to the City of Columbus, then to the Columbus Downtown Development Corporation. Between 2005 and 2008, the building’s interior was strategically demolished and rebuilt to accommodate office space for 13 new tenants, including the Ohio Environmental Protection Agency; the Ohio Department of Insurance; the Ohio Department of Job and Family Services; and the Ohio State University’s Urban Arts Space, an arts laboratory for faculty, students and community artists. Today, more than 1,800 employees come to work here. Duri ng the remodeling, energy-efficient windows, low-flow plumbing, and recycled flooring and baseboards were installed. Non-toxic adhesives, sealants and paints were used throughout the building. 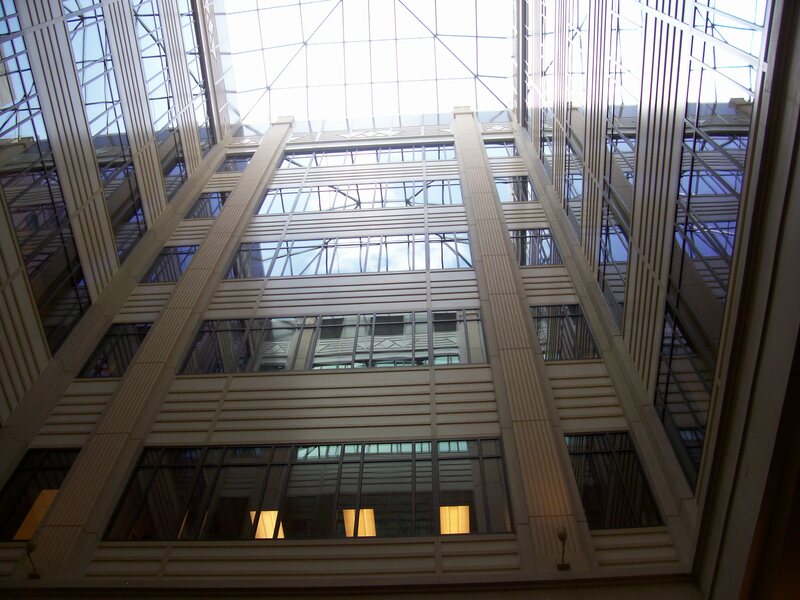 These steps led the building to become one of the country’s largest rehabilitated Leadership in Energy and Environmental Design (LEED) Gold-Certified buildings. 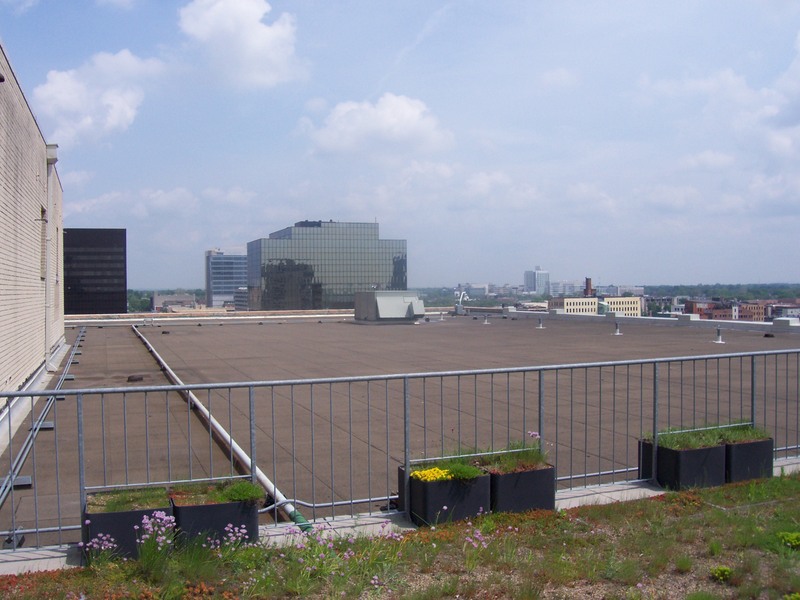 Today, the building maintains its environmentally conscious nature by using “green” cleaning supplies, participating in a successful recycling program, and maintaining a rainwater collection system on its Green Roof, a rooftop garden that reduces summer heat buildup and slows water runoff. 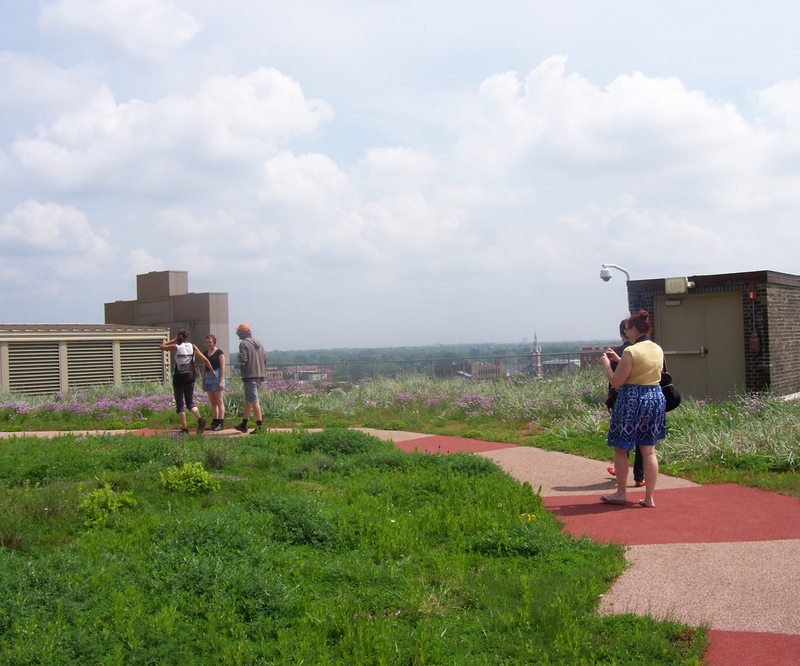 The OSU Urban Arts Space and the Columbus Downtown Development Corporation offer tours of the Lazarus Building rooftop garden on the first Friday of the month, from Spring through Fall. Reservations are required for these tours, and there’s a limit to the number of people who can take them, so they fill up quickly. I’ve been trying to see the Green Roof for almost two years, so this year I started early and successfully reserved a place on the May tour. Lazarus Building M anager Robert Turrin led the tour. Walking outside into the Galleria, which once was Wall Alley behind Lazarus, he noted that this feature of the building was where the Lazarus escalators were located. This allows natural light to come down through the building. After arriving on the sixth floor of the building, now part of the EPA’s office space, Mr. Turrin pointed out that the office’s floors were made of recycled linoleum, wood and tires. 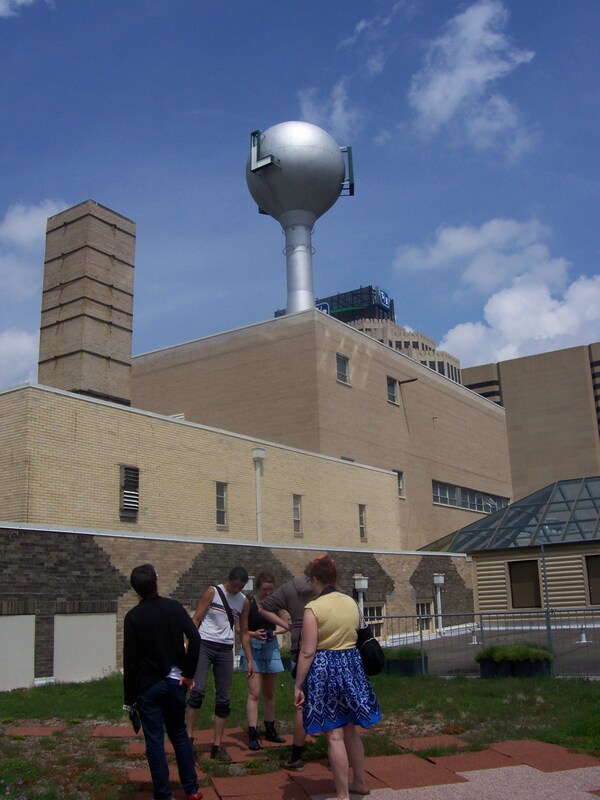 Then, we took a repurposed Lazarus elevator to the eighth floor and arrived at the Green Roof. Designed by Roofscapes, Inc. in Philadelphia, the 16,000-square-foot rooftop garden features over 60 varieties of plants indigenous to the Midwest. Cat’s foot, oxeye daisy, blue grama, Indian grass, dragon’s blood sedum, and self-heal are the garden’s main plants. Others include yarrow, garlic, dianthus, prostrate asters, potentilla, catmint and meadow fescue. Because the rooftop garden only has six to eight inches of growing medium, the plants have to have shallow root systems. 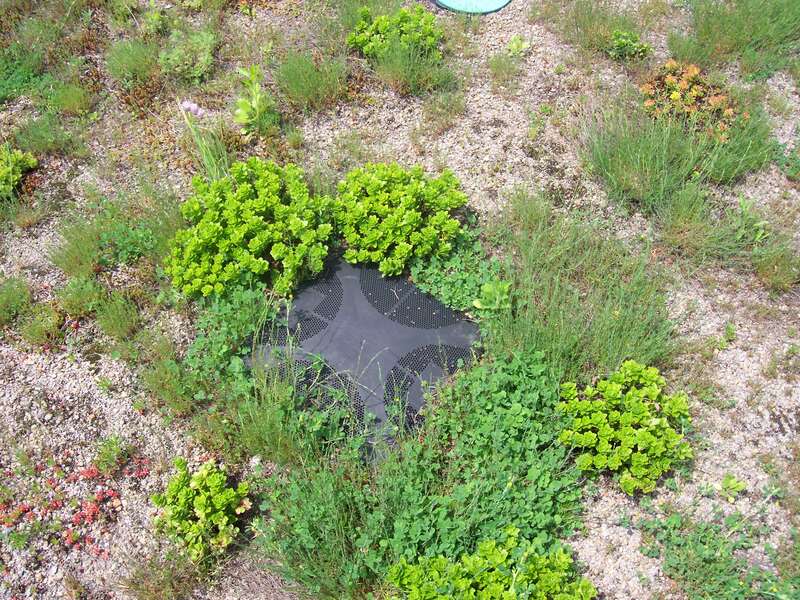 Three of the seven zones in the Green Roof hold drought-tolerant plants. The plants in the other four zones are watered through an irrigation system running off collected rainwater. Rainwater is filtered through the soil and in layers of insulation, roofing membrane root barriers, and structural support. The water is collected in a 40,000-gallon cistern in the basement, and is then pumped up to the 50,000-gallon “L” water tank that is still a recognizable symbol of the Lazarus Building. The water is then circulated down to also be used for flushing toilets throughout the building. Mr. Turrin said that over 2 million gallons of rainwater were collected in 2010. A ballasted rail system surrounding the garden is secured by recycled plastic planters and concrete pavers. Irrigation lines run through the railing into the planters. A sidewalk of 24-inch-square, two-inch-thick paver tiles creates a path through the garden. The tiles are made from recycled tires, discarded rubber toys and recycled products. Other rooftop gardens can be found at Chicago City Hall, the Kansas City Central Library and the Boston World Trade Center. This entry was posted in Columbus, Gardens. Bookmark the permalink. Cool concept. I am a fan of the LEED but wish it were less expensive. It seems the government is one of the few who can afford it.